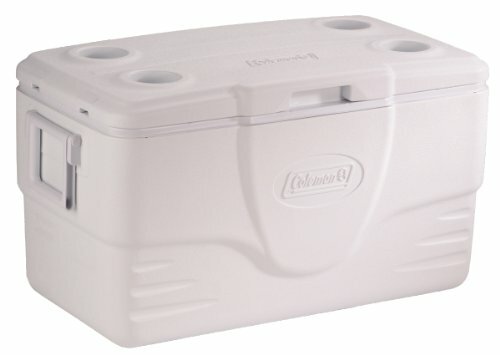 Keep food and drinks cold for nearly a week in the Coleman 50 Quart Cooler. Inside, ThermOZONE Insulation holds the cold free from CFCs, HFCs and HCFCs, which deplete the ozone. Inside, there is plenty of room for all your food and drinks. The chest is large enough to hold 71 cans—nearly three cases of soda. A hinged lid with four cup holders on top keeps your drinks close. When you're ready to pick up and move, the two-way handles make carrying more comfortable. At the end of the trip, just open up the rustproof, leak-resistant drain. The tilted channel does all the work for you.